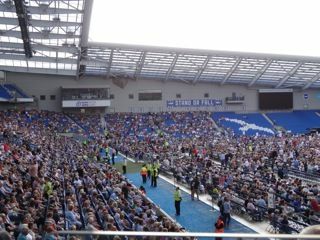 I attended the Amex for the first time as an away football supporter. I arrived by minibus and we parked up in the coach park area, this is a short distance from the ground but was on top of a hill. You had to use a lift to get down to the stadium level, there was only one lift which isn’t that large. I think one lift isn’t really enough and for a new ground could have been thought out better. It was a relatively easy process getting into the stadium but the concourse I found very crowded and quite compact compared to some other newer grounds. 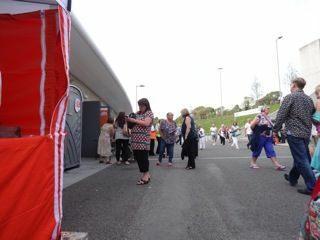 The disabled toilet was radar key operated, it wasn’t the biggest but was an adequate size for most wheelchair users. The wheelchair viewing area was at the back of the stand which gave an okay view of the pitch although I found when the person in the row in front of the platform was stood up his head obstructed my view of the goal. The accessibility was good but a couple of areas could have been improved on in my opinion. Third visit. Just as helpful staff as before. 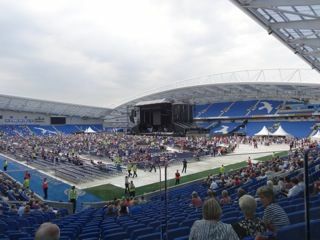 Really accessible stadium. Good to be in with fans rather than segregated. Other clubs take note. Went by train this time. See ratings for Shoreham, Brighton and Falmer rail stations. Second visit was for Rod Stewart. Still great access. Photos added. This was my first visit. 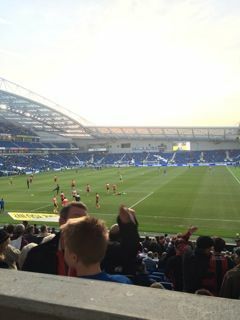 I went as an away supporter using park-and-ride (see Brighton Racecourse for rating). Everything at the ground was well set-up. Getting off the bus was simple; slopes and a lift leading to the stadium. Inside the ground the toilets were small but ok. Viewing position was excellent even if supporters stood up in front.